This article originally appeared at Truthdig.com. As the dust settles on the release of the Ken Burns and Lynn Novick opus “The Vietnam War,” and as the cacophony of criticism quiets, a major issue remains largely unaddressed—U.S. culpability for war crimes in Vietnam. President Barack Obama’s visit to Hanoi in 2016 seemed a turning point as he offered his hand in friendship to Vietnamese President Truong Tan Sang, but there were no apologies forthcoming, and no acknowledgement of culpability for a U.S. war of aggression. Nor was there an outcry in the press that something was missing. There is no statute of limitations on war crimes, as trials of aging German war criminals and of Bosnians and Rwandans attest. But the trying of Americans, especially powerful Americans, is another story entirely. Former Secretary of State Henry Kissinger, who still enjoys high status as an adviser to the powerful (his crimes long ago normalized), comes to mind as a potential target of inquiry. But perhaps more important than the actual indictment of American war criminals is the corrosive effect of old war crimes on the American conscience. Avoidance of the conversation muddles our ability to judge what military ventures are appropriate, and how to prosecute them. The fog of war has become a constant state. Unfortunately, Burns and Novick’s epic recap of the war stops short of the treatment that might help us internalize the lessons we need. Because their film promises to define the conversation about Vietnam for decades to come, it is vital that critical analysis and debate continue. 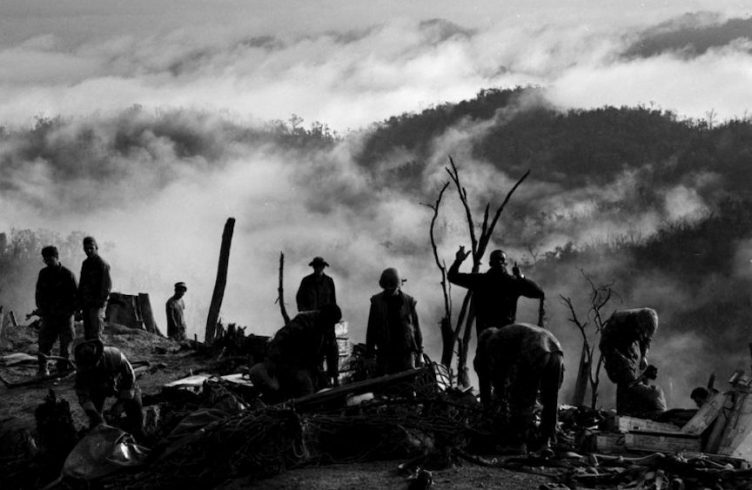 By virtue of their power of presentation and the wide exposure their film will receive, Burns and Novick have established themselves as the framers of our collective memory on Vietnam. Power infers responsibility—theirs was to get the history clear and right. They have gotten a lot right—the sense of Vietnamese and Americans’ shared humanity, of the tragedy and depraved brutality of the war and the persistent lying on the part of our leadership. And, while they have started a robust and vital dialogue about Vietnam that we wouldn’t be engaged in otherwise, crucial elements are either missing or misstated. These elements keep the Vietnam opus from being the masterpiece it could have been and confound our ability to draw the most useful lessons from the conflict. A fundamental confusion undermines “The Vietnam War.” Was it a civil war or a U.S. war of aggression? Though everything they depict adds up to the latter, the filmmakers avoid that inevitable and damning conclusion. They present the Geneva Accords, which called for an election in 1956 to reunify the country under one government after its temporary division at the 17th parallel. But they fail to drive home that U.S. subversion of that international accord was just a beat in a long line of premeditated aggression. For the record, the waging of war in ​subversion of an international accord is deemed a crime against peace. In fact, the U.S. undermined the 1956 election (which never occurred), supported Ngo Dinh Diem as leader of its first puppet regime, dispensed with Diem when his usefulness ran out, and then installed and propped up a series of puppet “governments.” South Vietnam was a client state—not a legitimate and representative government. But the filmmakers persist in treating South Vietnam as a legitimate representative of the South Vietnamese. In their insistence on not taking sides, the filmmakers instead perpetuate the old—and fully debunked—“civil war” narrative that led us to war. Their voice-over narration cites the enemy as “the north,” contributing to the “civil war” confusion. But Pentagon-sponsored research had established as early as December 1964 that the “enemy” had southern origins. Viewers might recall that in Episode 4, the film reveals the little known Viet Cong Motivation and Morale Study, a Rand Corp. investigation inspired by Defense Secretary Robert McNamara’s research question: What makes the Viet Cong tick? The first study group reported its results in December 1964 to Ambassador Maxwell Taylor and Gen. William Westmoreland and to the Department of Defense in January 1965. The striking substance of that report, not covered in the film, underscores a central contradiction in the framing of the Vietnam War. The Rand analysts explained that the enemy in the south was not the jungle insurgency they had expected, but rather a popular government that carried out normal governmental tasks in wide swaths of the countryside. Most pertinent to this discussion, the Provisional Revolutionary Government and its army, the National Liberation Front (as the Viet Cong called themselves), was a movement “by and for southerners,” the analysts said. Their description of the enemy’s resolute determination to fight to the finish for reunification of Vietnam and what they termed “peace with freedom,” prompted a Pentagon deputy to declare, “If what you say is true, we’re fighting on the wrong side—the side that’s going to lose this war.” That memorable quote appears in the film, but without the context that would clarify its meaning. The Rand analysts’ emphasis on southern origins of the resistance is well supported by subsequent research. New York University history professor Marilyn Young documented how southern-bred resistance to Diem’s reign of terror in the countryside—suspected Communists were rounded up and executed en masse—precipitated the north’s entry into the war. Even Le Duan, secretary general of the Communist Party of Vietnam, had opposed armed insurrection in the south, arguing that “consolidation of the north was the pre-eminent revolutionary task” and sanctioning only political struggle. Flaunting Le Duan’s directive, remnants of the Viet Minh formed self-defense units that eventually forced the northern-based party to sanction official formation and arming of the National Liberation Front and to come to their direct aid. Well known, as documented in the Pentagon Papers, was the expected outcome of the thwarted 1956 elections. Vietnam would have been reunited as one country under the Communist leadership of Ho Chi Minh. The argument of North Vietnamese aggression evaporates once we’ve debunked the Tonkin Gulf Incident (see the Pentagon Papers), and dispensed with the myth of two Vietnams and the ensuing illusion of the U.S. as protector of a democratic South Vietnamese government. With those props gone, our war effort is thrown into stark relief. We were the aggressors. The distinction of who was the aggressor in Vietnam couldn’t be more important. Under international law, a response to aggression is the only legitimate reason to wage war. The Nuremburg trials, which were led by U.S. efforts, established that aggression is the gravest war crime of all, because it is aggression that undermines the peace and serves as a precursor to other war crimes. That is why the U.S. was so intent on painting North Vietnam as the aggressor—only then would Congress and international opinion sanction the war. The filmmakers’ failure to identify the aggressor and their clouding of the issue with the old “civil war” construct deprives the public of a framework for analysis. Of course, U.S. aggression did, in fact, serve as a precursor to other crimes. The filmmakers rightfully acknowledge My Lai as an atrocity. And the film depicts other atrocities, including Zippo raids on villages and the use of Agent Orange and napalm. It touches on pacification. But it doesn’t connect the dots for viewers who don’t know the history. We don’t learn that destruction of the very fabric of Vietnamese life was fully intentional, that full-out assault on civilians was central to U.S. war strategy. Most distressingly, for anyone interested in our nation’s compliance with international law, all of this adds up to war crimes and crimes against humanity. Take the strategy with the most benign name—pacification. What this meant in practice was the purposeful displacement of half the population of South Vietnam. Because it was recognized that the guerrillas were fish in the sea of the people, U.S. strategists aimed to drain the sea to deprive the guerillas of their support base. Zippo raids destroyed the villages while Agent Orange destroyed the crops, and villagers were forced into resettlement camps surrounded by barbed wire. The purposeful generation of refugees is a war crime, which the documentary fails to name. The film’s treatment of the Phoenix Program bears particular mention. The voice-over describing the program states that former chief of pacification and CIA Director​ William Colby testified to Congress that it couldn’t be determined how many of the more than 20,000 identified Communists killed under Phoenix had been innocent. Let’s unpack the implications of that statement. Under Phoenix, suspected Communists were detained, tortured and then killed. The suspects included civilians—men, women and children. Guilty or innocent, Communist or not, we are proscribed by the rules of war from summarily executing those we capture, not to mention the proscription against torture. I learned that much as a kid watching World War II movies. But the implication, as it is presented, is that “innocents” might have been caught in too big a net, not that torture and murder of any and all captives is illegal. Then there is the bombing. The most strident voice calling out the air war in the film is that of Jane Fonda. Fonda’s regrettable decision to condemn the air war while perched on an anti-aircraft gun undermined her message. But she spoke an essential truth. The carpet bombing with B-52s was a war crime. The filmmakers’ decision to frame the “Hanoi Jane” episode with a clip from “Barbarella” and former Marine John Musgrave’s sexual fantasies neutralized the single voice calling out for a war crimes inquiry of the bombing. This is a glaring lapse of editorial judgment on the filmmakers’ part—the titillating “Barbarella” clip belongs on the cutting-room floor. Lest it be misconstrued, discussion of war crimes was not confined to the left. Fonda’s call for a war crimes inquiry was echoed during the late 1960s and ’70s, especially after My Lai. To cite just a few examples, Nurembergprosecutor and U.S. Brig. Gen. Telford Taylor took a leading role, alongside members of Congress and American scholars and jurists and GIs who launched their own investigation, in the discussion of potential war crimes charges that might be leveled at U.S. leaders. Taylor wrote a treatise on the applicability of Nuremberg to Vietnam, titled “Nuremburg and Vietnam: An American Tragedy” (1970). And a small book titled “War Crimes and the American Conscience” chronicles the Congressional Conference on War and National Responsibility held in 1970, in response to My Lai. These were only two of a score of war-crimes offerings from the period, as Neil Sheehan of The New York Times documented. While a documentary can’t cover everything, the broad-based outcry against U.S. aggression and war crimes demands full treatment. Conference participants did not reach consensus on the issue of genocide, with some arguing that the war was inherently genocidal and others opining that U.S. crimes did not meet the criteria for genocide designation. That war crimes and crimes against humanity had been committed was not debated. My Lai was put into terrible relief when author Jonathan Schell described a two-week journalism stint flying over Quang Nai, the province where My Lai is located. From the air, he charted B-52 destruction of the province, shading the destroyed areas on military maps, and documented that 70 percent of the villages there had been destroyed from the air. He corroborated his findings with interviews of ground commanders. The My Lai massacre occurred three months later. It was not isolated. An estimated 2 million civilians died in the war and half the population—approximately 8 million people—were driven from their homes. That is a holocaust. But Burns and Novick don’t acknowledge the full implications of aggressive war and its progeny—the host of war crimes we inflicted on Vietnam, Laos and Cambodia. Rather, the filmmakers couch their exposure of war crimes with misplaced journalistic “impartiality.” In Episode 9, John Kerry, representing the Vietnam Veterans Against the War, offers riveting congressional testimony that identifies specific war crimes and contextualizes them. But what could have been an opening to an analysis of systemic war crimes is checked by the insertion of an interview that denies systemic abuse. There are other strong moments, such as when Vietnam veteran and author Tim O’Brien questions how the My Lai perpetrators could escape unpunished and when a Vietnamese survivor recalls the devastation on the ground after a bombing. But even as they portray atrocities inflicted by U.S. forces, the atrocities are particularized. We see the devastating impact of napalm on Kim Phuc, but we don’t appreciate how many civilians that criminal enterprise killed or maimed as our armed forces targeted civilian centers. Coverage of the Winter Soldier Investigation would have dispensed with the notion that war crimes were anything but systemic—but the GIs’ devastating 1971 inquiry isn’t covered. Most importantly, the atrocities covered by the film might have had restorative impact if they had been framed with an analysis of aggressive war—in other words, an analysis that imparts lasting lessons. As profound and simultaneously flawed as it is, “The Vietnam War” offers Americans a vital opportunity to re-examine Vietnam. Arguably, a film that addressed the war as a war of aggression with full disclosure of its terrible implications most likely never would have been made. Viewed from that perspective, Burns and Novick’s series is a considerable achievement. But it is one that requires us to continue its unfinished work. To grapple with such damning conclusions as those proposed here, the public needs an 11th episode—our own multifaceted inquiry into what occurred in Vietnam. One element that needs further exploration is the role of the anti-war movement: who fought, what we said and how we said it. And how GIs, resistors, deserters, conscientious objectors, concerned clergy, students, workers and academics, blacks and whites, Asians and Latinos—in short, the full spectrum of society—joined forces to stop U.S aggression. That chapter has not been fleshed out and bears telling. A haunting song of the period that could serve as soundtrack to the 11th episode is Holly Near’s “No More Genocide in My Name.” I remember that being called as a chant at demonstrations against the war. I lived and demonstrated in Los Angeles, where Ron Kovic, the subject of the movie “Born on the Fourth of July,” and Daniel Ellsberg and Tony Russo, the Pentagon Papers co-defendants, regularly marched with us. To my recollection, Russo first raised the “no more genocide” chant (the most likely inspiration for the song). Those words were intensely personal to Russo, who was listed as an author of Rand Corp. reports that advocated the air war and other crimes against humanity. A half-century later, it is time we face up to the true nature of the horror of Vietnam. Until we acknowledge the criminality of U.S. aggression in all its forms, until we call out loudly and clearly that there will be no more war crimes in our names, we will fail to safeguard our essential morality and be doomed to fateful repetition. Our calls for democracy will remain hollow, stripped of their core by our crimes against humanity. And our fatal flaw will not go unnoticed. Barbara Myers is an independent journalist, with historically based film and print stories set in Vietnam, China and Rwanda, and the author of The Other Conspirator, The Secret Origins of the CIA’s Torture Program and the Forgotten Man Who Tried to Expose It.